The days are getting longer and much cooler now. Summer is nearing its end and Fall is just around the corner. Here in British Columbia, Canada, the Autumn Equinox 2017, in the Northern Hemisphere will be at 13:02 PST on Friday, September 22. I can feel the chill in the early morning air as I make my way to the river. New batteries in my headlight make the path to the river bank well lit and easy to follow. I can legally begin to fish 1 hour before sunrise here in Southwestern British Columbia and the path to the river is still covered in total darkness. I am fishing the Chilliwack/Vedder River this morning and I am walking with a purpose, to the river, to spend a third straight day with my new Shimano Calcutta 400B Baitcaster Reel. Late Summer and early Fall is always an exciting time of year for me. The salmon are beginning their migration up the rivers and the thought of landing THE big one is occupying a lot of my time. For too long now I have been struggling with my old Abu Garcia, Ambassadeur. Watching my friends reel in Pink Salmon, which cannot be kept because of regulations, and the odd Chinook was a very frustrating exercise. I was spending too much time adjusting my drag and even worst … untangling “birds nests”. Three of my river buddies fish with the Shimano Calcutta 400B. Nice guys that they are, they were more than happy to let me try a few casts from their fishing reels. Got to try a few dozen casts from a few of the boys, and I must say that I was very impressed from the very beginning, … and why not? New reels with specially treated stainless steel bearings, and a Variable Brake System (VBS) that uses centrifugal force rather than magnets to aid in controlling the cast. This makes for increased distance and easier adjustability. It felt like fishing in Heaven and I knew that I had to get one. It felt like casting on a cloud. The Shimano Calcutta 400B reel is known as a Round Reel as opposed to a low profile reel. It offers outstanding Shimano quality, dependability, and value. These excellent quality-engineered fishing reels come in right-hand and left-hand models and can be used for freshwater and saltwater fishing. Dartainium Drag material provides a wide range of drag settings and the smoothest Shimano drag performance ever. Quick Take Down by unscrewing the 3 thumb screws the side plate can be easily removed for maintenance or to adjust the VBS brake weights. Septon handle grip material is soft to the touch and does not get slippery when wet. SV Power Paddles The largest of the paddle grips provides extra fish fighting power when battling feisty inshore species. This will greatly INCREASE your price and PROBLEMS. there should be easier ways to purchase this Reel in Canada from Amazon. Unavailability in Canada will force Amazon customers to go elsewhere. check with Amazon. ca at time of purchase, as this may be subject to change. excellent reel, but no need to mortgage the house or go nuts to go FISHING! 4 Things to Consider, from the manufacturer, when purchasing a Baitcasting Reel. Everyone fishing freshwater and saltwater should try the Shimano family of fishing reels. I am sure that many of your friends have them and if not, it may be possible to try them out at fishing shows and other such places. The Shimano Calcutta 400B is a smooth casting, well engineered, fishing reel that is very popular on British Columbia rivers. Many people that I speak to on my “river walks” and fishing adventures either own one, have friends that own a Shimano or have considered getting one for themselves. It is a very respected Fishing Reel and a true workforce that performs season after season, year after year. Always nice-to-have, and a must to protect the lifetime investment is a Shimano Round Baitcasting Neoprene Reel Cover. Here is the Shimano in action on a nice sunny day in Thailand. 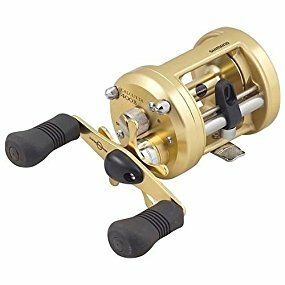 If you have any comments, questions, or suggestions on this fishing reel or any other fishing reel, I would be pleased to hear them. Fishing reels are a varied and extensive line of products. The Shimano Calcutta 400B is an excellent, smooth casting reel. A pleasure to cast and even more fun to retrieve with a fish on. Well you sure caught my attention. I am an avid fisherman in Alberta and have been thinking about a bait caster for a very long time now. Not sure what has stopped me. Anyways I read your review and I do like the sounds of things. Would however be helpful if you could clear a little up for me. My main fishing here is pike, walleye and perch and some small trout. Would this be too much reel for those fish or is it adaptable to different sizes. If you could clarify this then you just may have a customer. Thanks, Dale, for stopping by to read my blog. The Shimano 400B Calcutta is in my opinion, too much reel for the smaller fish. It is however, an excellent contender for those Big Pike! There are smaller series reels in the Shimano Line, such as the 100 and 200 series. Fishing Reels are much like Guns and Horses. It never hurts to own more than one. Shimano Reels have an excellent reputation with a lot of folk, however, like Fords and Chevs, every one has their favorites. I know many people that have fished with this reel on B.C. rivers for over 10 years. I have seen these reels and they look superb. It all depends on how you take care of your gear. I read reviews of people who hate them, but I suspect that these people hate everything, including themselves. In any case, I am leaving within the hour, for an outdoor adventure of a few days duration. Hope this helps and please return to tell me about your decision, irregardless of your choice. I can be reached at ( pauldegrosnez14@gmail.com) or leave a comment at the bottom of my web page. Tight Lines! and good Luck Fishing. Don’t let those BIG ONES get away. Sweet review. I work at an outdoor retailer and one way I know this is a quality review is because we sell a lot of these. I know one of the biggest challenges I have faced when using these types of reels is dealing with the back play so I like how there is an anti-reverse function to prevent those spiders nests. Thanks Austin, for dropping by and reviewing my blog. I love your expression, “spider’s nest”. In my neck of the woods, we call them “bird’s nests”. In any event, we all know what they mean, and we are not very impressed with ourselves when we create one. This is a “quality” reel that was suggested to me, “on-the-river”, by a very REAL river fisherman that has evolved BEYOND fishing! I don’t fish often but have a friend who loves it and goes all the time. This reel looks great and I am sure it will be fun to fish with this! Thanks, Dinh. I am sure that many of your friends fish on the river with me. They are excellent fishermen and I get along well with them. Do you fish rivers or lakes? As you point out, this is a great piece of fishing gear and a joy to use on the river. Happy Fishing! Paul.